Poet Sim Stafford and I were in high school together, and then we both went to the same university, and one time, during my freshman year, when I was having a moment, he said, “once a Dukie, always a Dukie.” He wasn’t talking about school spirit – he was saying that my life had changed, and that I should accept this. Looking back on it, it was like crossing a certain line. Like falling in love. No matter how many years go by, something inside of you belongs to that love. Your heart is mortgaged. People living on campus today will never forget the 2010 NCAA Final. If you’re old like me, though, you’ll also keep looking back at that night that Sean Dockery beat VT. You know what I’m talking about. And not just because we were younger then. The title of the book about the Duke-Carolina rivalry is, To Hate Like This Is to Be Happy Forever. It’s a good book, but it’s also just a beautiful sentence. I would add – To Be Hated Like This Is to Be Happy Forever. 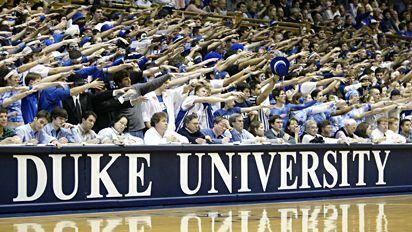 If you’re a Duke fan, you’re used to it. It bounces off of you like a ray of sunshine. I don’t ache to relive my college years. My life is exciting enough as it is right now – sometimes even a little too much so. But the happy memories from that time act like ballast. The one time I was in Krzyzewskiville, I ended up getting trapped while a severe storm passed overhead, and some guy yelled, “you alive in there?” outside the tent, and all I could think of was, “do I ever feel alive.” I remember our voodoo cookies. I remember how at night, campus was divided into these little nests that exploded with each foul call, going “whoosh” with each free throw that made it in, so that if you stood dead center in the middle of some quad, you could hear the screaming coming at you from all sides. When I was a senior in high school, I was told, in very explicit terms, that I had a snowball’s chance in hell of making it Duke. I needed to apply to Carolina. In fact, I needed to apply to Carolina early – as soon as possible. When Zoubek made that last freethrow, I whooshed. Not gonna lie. My heart’s been whooshing all day.